While working in your Camera or Drawing view, you may need to pick a colour from your drawing without going to the Colour Palette view, especially if you do not know which colour swatch it is. To do this, you use the Dropper tool. 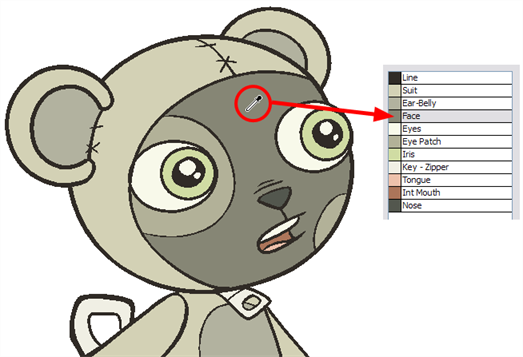 Once you select your colour on your drawing using the Dropper tool, the colour swatch is automatically selected in the Colour Palette view. 1. In the Drawing Tools toolbar, select the Dropper tool, under the Paint tool category or select Tools > Drawing Tools > Dropper. 2. In the Camera or Drawing view, click on the colour zone you want to select the colour from.